Nutella brownies. Just let that phrase sink in for a minute. Nutella brownies. Even the name is sinful. The first time I had Nutella was in Italy. The hotels there served crusty rolls for breakfast with little packets of Nutella spread on the side. It was a far cry from the cereal and milk I was used to (and craving), but the chocolately hazelnut spread was enough to make up for what I was missing. (I can’t say the same about the horribly bitter hot chocolate that needed several heaping spoonfuls of sugar to make it at all palatable. But I digress.) Baking with Nutella seems to be all the rage these days so I had to give it a try. After quite a long search for Nutella brownie recipes I settled on the simplest one because the only specialty ingredient it required me to buy was a jar of Nutella. 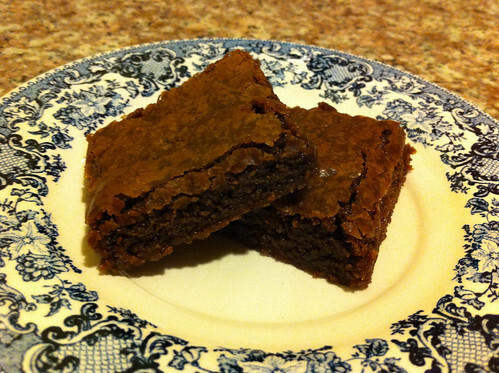 These brownies were really easy to make and outrageously delicious when they were done! Seriously, I had trouble keeping out of them so I wrapped the majority up in Saran Wrap to to to work with me the next day. 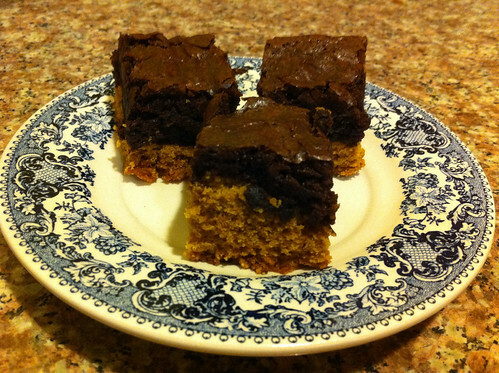 So if you like brownies and you don’t dislike hazelnuts you really must try this recipe. I’ve been tempted to buy another jar of Nutella and whip up another batch, but I know it would be bad for my waistline! In a medium bowl, beat the butter and sugar together until creamy. Add the eggs, vanilla, and Nutella and beat until combined. Add the flour and salt and beat until just combined. Pour the batter into an 11×7″ pan lined with aluminum foil and sprayed with cooking spray. The aluminum foil will make it easier to extract the brownies from the pan and slice when they’re done. Bake at 350 deg F for 27-32 minutes or until a toothpick inserted in the center comes out with just a few moist crumbs attached (no batter). Cool completely in the pan on a wire rack before slicing and serving. Enjoy! Based on Mother Thyme’s Nutella Brownies. 1) My husband. Dan was so sweet to me when I was sick. He took care of dinner every night, bought me orange juice to make sure I got enough vitamin C, and called me several times during the days I stayed home from work to see how I was doing. 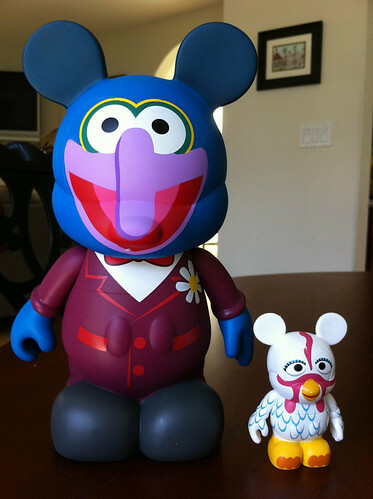 Combine all that with the adorable Gonzo and Camilla Vinylmations I posted yesterday, Dan has earned some major brownie points this week! 2) My job. I am very thankful to have a job that allows me to take two days of sick leave with very little trouble. I realize that a lot of folks don’t have that flexibility, like my mom who always had to find a substitute teacher when she was sick. There’s a reason teachers don’t take that many days off! Luckily all I had to do was call my boss and tell him I was staying home and keeping my germs to myself. 3) My assignment. After laying around the house like a slug on Monday and Tuesday, going back to work was like an adventure. And it was really great to go back to an interesting assignment rather than the boring document updates that took me months. It certainly made the hours fly by. Especially when my sinuses were killing me and I considered going back home to wallow in my misery. 4) My co-workers. Everyone I work with asked me how I was feeling yesterday when they heard I was out sick for two days. It certainly makes a person feel special. I have a feeling some of those people needed me to do some work for them so their concern wasn’t exactly sincere, but I’m willing to overlook that. Who am I to throw away a confidence boost, wherever it comes from? 5) Togo’s sandwiches. OK, this one is a little superficial, but I was so hungry when I left work yesterday that I went directly to Togo’s for a semi-early dinner. And I got a sandwich for Dan’s dinner too. Delicious sandwich and no cooking! Bonus! 6) Three-day work weeks. Even though being sick on Monday and Tuesday was a drag, I do appreciate that it allowed me to just work three days this week. And those three days were really productive – like it wasn’t a short week at all! 7) Fridays! How could I forget this one? Fridays in the fall are for wearing Gator sweatshirts and gearing up for the weekend. Not that I have any plans bigger than watching football and rugby and taking my last half marathon training walk, but I’m still looking forward to it. A package arrived on Monday with Dan’s name on it so I put it on the dining room table for him. When he got home he asked me to open it, which was a little odd. As I pulled the brown construction paper off the top I uncovered the box containing these adorable Gonzo and Camilla Vinylmations. Aren’t they precious? I was coveting this set before it was released, but I decided it was too expensive. But Dan knew how much I wanted it so he bought Gonzo and Camilla for me as an “I love you gift,” as he put it. Don’t I have a wonderful husband? P.S. I went to work today not because I was feeling that much better, but because I wanted to get out of the house! ***I’m home sick from work for the second day. A head cold hit me on Sunday morning and I’ve been pretty much out of commission since then. I feel rotten. A day off always sounds like some sort of vacation until you’re sick and you can’t enjoy it at all. Leaving the house isn’t really an option and all of your entertainment options get old fast. It’s boring. I finished my last library book last night (The Help which was fantastic) and I’ve already watched way too much terrible television. Too bad my head feels so awful (and I’m probably pretty contagious) or I’d be tempted to go to work just to break the monotony. Hopefully I’ll be well enough to go tomorrow because I have a lot I need to accomplish in the next week. Plus I’m not crazy about missing another spinning class. At least I got my weekly half marathon training walk in on Saturday before I got sick. ***It might be a bit premature, but I hate the new Delicious site design that premiered today. And according to all the complaints on Delicious’s Facebook fan page I’m not alone. I have been saving my bookmarks there (mostly recipes) for four years and for some reason the powers that be decided to removed almost all of the site’s functionality this morning. Boo! I need to get to my fall baking recipes ASAP! ***Speaking of baking, on Sunday I watched “Home Alone 2: Lost in New York” on TV and it reminded me that the holiday season is fast approaching. As far as I’m concerned October 1st is the day I can start my preparations – decorating the house for Halloween, bulk-buying baking supplies, and figuring out what to do for Thanksgiving. Yep, the three double-digit months at the end of the year are definitely my favorites, and October 1st is just three days away! Dan and I already went shopping for Halloween stuff at Target so I guess we jumped the gun this year, but we wanted to go before everything was picked over. One of the items on my holiday baking list is peanut butter blossoms. You know, the little peanut butter cookies with a Hershey’s Kiss on top? My mom and I used to make them every year for Christmas get-togethers so they’re very nostalgic. She emailed me the recipe the other day and I’m dying to make some. Unfortunately the price for Hershey’s Kisses at my local grocery store is akin to highway robbery so I’ll have to get some at Target or Walmart instead. Hopefully by this time next week I’ll have a batch of peanut butter blossoms to share with my co-workers. ***I bought some new makeup on Saturday and I think I’m in love. It’s L’Oreal True Match makeup in Porcelain (the absolute fairest shade). It has SPF 17 (with Titanium Dioxide), it has a powdery finish, and it’s actually the right color for my pale skin! Granted I’ve only used it once so far, but I think it’s going to be perfect. Until now I’ve been using Cover Girl TruBlend in Ivory which doesn’t have any sunscreen and is slightly too dark for my complexion so I have to apply it very lightly. For girls like me who don’t intentionally tan, finding foundation in a light enough shade is not easy. So if you’re familiar with this struggle, check out L’Oreal True Match! ***Trying to find a hotel on Maui where Dan and I can for a single night at the beginning of our trip to Hawaii has turned out to be nearly impossible. All five of the bed and breakfasts I’ve contacted have a two-night minimum stay. I finally resorted to booking a room for us at the Days Inn Maui Oceanfront for the night we arrive. We’re checking into the Waldorf Astoria Grand Wailea Resort for the second and third nights of our trip, but I didn’t realize it would be so difficult to find a place for the first night. Now I can start my search for hotels in Lahaina and Hana. The details of our trip are still up in the air, but I’m going to feel much more porepared when we have a place to stay each night! It’s that time of year again – time for me to get way too ambitious about my yearly holiday baking. This time last year I wrote a post about my 2010 holiday baking plans, which were quite lofty (and, in hindsight, completely unrealistic). Then in January I wrote a post about my actual 2010 holiday baking, which was (unsurprisingly) much more modest. In fact, I only made just enough baked goods to fill my annual holiday care packages for friends and family. This year I’m definitely trying to do better. In fact, I’ve already started! The photo above is of a delicious concoction whose name I haven’t quite decided on. The best options I’ve come up with so far are 1) brownie-topped pumpkin cookie bars, or 2) pumpkin cookie and brownie bars. I’m leaning towards the latter. These double-decker treats may look complicated, but they are ridiculously easy to make. Simple, right? And I got a lot of compliments on them at work so I know they were a success. I didn’t like these bars as well as when I made them with a peanut butter layer, but the pumpkin cookie mix definitely made them seasonally appropriate. I’ve already started gathering other recipes to to try this fall and I’m excited to see which ones turn out well. Hopefully this year’s holiday care packages will be the best yet! I’ll have to balance these yummy baked goods with my preparations for our Hawaii trip in November, though. I love baking, but I want to be confident wearing a bikini when we go to Maui! That looks like a lovely bowl of homemade chicken curry and rice, right? And it was. Too bad that one serving is the only bit that survived my kitchen exploits yesterday. I can hardly believe what I did. Sometimes I imagine all manners of horrible disasters that could happen and then I thank my lucky stars that they’re just in my head. Unfortunately yesterday one of them became a reality. But let me start at the beginning. 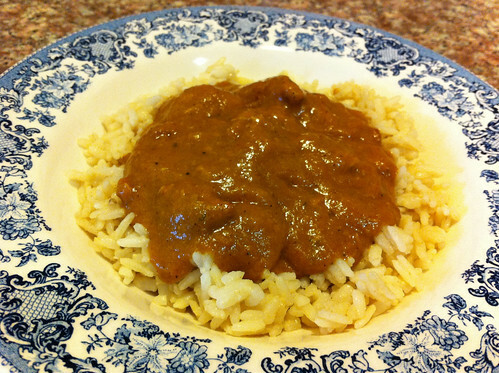 On Tuesday I made a batch of curry sauce using this recipe from Three Many Cooks. This sauce was a different than any other curry I’ve made because it required me to puree an onion and a bell pepper before adding the traditional ingredients (coconut milk, tomato paste, and spices). At least I got to used the Magic Bullet blender than I bought many years ago after watching an infomercial in the wee hours of the morning. Not my best purchase. Since I didn’t have enough time to slow cook the chicken curry that night I put the sauce in the fridge to wait for a less busy evening. On Thursday night I threw the sauce into my Crockpot with some diced chicken and cooked it for about four hours before I decided it was done. This was my fourth attempt at making chicken curry, but it smelled fantastic so I had high hopes for this batch. Dan and I didn’t eat the curry for dinner that night because it took so long to cook, so I dumped the contents of my Crockpot into a large Corningware dish and put it in the fridge. Finally yesterday I decided I was going to eat some of the meal I’d been preparing for the last four days. I spooned a single serving into a bowl and put it into the microwave to reheat. There was still a lot of the curry left so I was going to put it back in the fridge for another meal. This is when it all went wrong. The big Corningware dish had some condensation on the outside and it slipped out of my hands I was was trying to hoist it onto the top shelf. Can you picture this? The dish fell onto the kitchen floor, shattered, and bright orange curry sauce went everywhere. My new New Balance shoes were covered in it and my jeans were pretty well coated as well. The sauce was also on the inside of the fridge, the outside of the fridge, and on the front of the oven. I stood there in shock for a few seconds before I ran outside to shed my sneakers and start cleaning up. Dan was kind enough to hose off my shoes before any permanent damage was done. It took a while, but I managed to remove all signs of my clumsiness from the kitchen and the only lasting damage is a broken piece of plastic in the refrigerator (the top of the meat and cheese drawer). I still can’t believe it happened, though. From now on I’m going to be extra careful when I’m putting stuff away. I really didn’t accomplish anything last weekend. And I’m not just saying that. Last Saturday morning I stayed in bed and read a book until almost noon. Then I made a quick trip to Togo’s for sandwiches before the Gator football game started. I didn’t quite make it back before 12:30, but thanks to our DVR I didn’t miss any of the game. Then I spent the next four hours watching Florida beat Tennessee in their first SEC challenge of the season. That was very satisfying. As soon as the game was over I got ready for my weekly half marathon training walk. Dan was asleep on the couch when I left the house and I was afraid he was going to stay there rather than go on the 18-mile run he had planned. Exercising outside in the evening is fantastic because the temperature is dropping and you don’t have to worry about getting too much sun. There were a lot of people at the beach to watch the sun set into the Pacific Ocean. A month ago they’d have all been wearing bathing suits and shorts, but last Saturday everyone had on a sweatshirt instead. Fall has definitely arrived in Los Angeles! At 7 PM I got a text from Dan telling me that he had just started his run. We passed each other somewhere between the Hermosa and Manhattan Beach piers. After 3 hours and 51 minutes of walking, a fairly respectable time for 13+ miles, I arrived back at home again. I took a shower and started thinking about dinner, but Dan wasn’t doing so well when he got back from his run. After his shower he went straight to bed. I stayed up for a couple of hours by myself eating pizza and ice cream and watching TV, but it wasn’t as fun without Dan. I read a little more on Sunday morning before convincing myself that I needed to get up and go to the gym. I was in a rotten mood that morning and I thought exercise would make me feel better. Luckily I was right. 55 minutes on the elliptical and 45 minutes on the stationary bike really lifted my spirits, even if my legs weren’t too happy about another workout. Dan and I had early dinner reservations at Hatfield’s restaurant in Hollywood so we left to drive up there around 4:30 PM. Hatfield’s is right across the street from Pizzeria Mozza and Osteria Mozza where we’ve eaten before, and since it’s supposed to be one of LA’s best restaurants we had to try it. And we weren’t disappointed. My appetizer was Berkshire Pork Ravioli and I think was the best dish we ordered that night. Dan agreed. My entree of Slow Cooked Pork Loin and Crispy Belly was tasty too, but not quite as good as the ravioli. My Peanut Butter-Caramel Ganache Tart dessert was kind of a disappointment, but the homemade Salted Caramel Ice Cream on the side was divine. I should know by now that if a restaurant makes their own ice cream I shouldn’t pass it up (like at Craft). I would have loved that salted caramel ice cream by itself. When we got home Dan and I crashed on the couch and watched this week’s episodes of “Ice Road Truckers” and “Top Gear US” (the season finale) as we recovered from dinner. It was a good way to end the weekend with my wonderful husband. If you’ve ever eaten at Potbelly Sandwiches and left without sampling one of their oatmeal chocolate chip cookies, you’re a fool. I understand passing up their sugar cookies because the grease ring they leave behind when you set them down on a napkin is unnerving, but the oatmeal chocolate chip cookies are perfection. I’ve been wanting re-create these delicious concoctions at home, but it’s turned out to be more difficult than I thought. So far I’ve tried two different recipes – the first one was a flop, but the second one, which is the one posted here, was much better. The cookies weren’t nearly as dense and buttery as as ones at Potbelly, but they were still really good. Crispy on the outside, soft on the inside, with a delicious buttery flavor. I have one or two more recipes that I’d like to experiment with, but I wanted to share this one because it turned out so well. I used semi-sweet chocolate chips because that’s what I had on hand, but I think milk chocolate would be better. I’ll try that in my next batch and let you know how it turns out. I really wish Potbelly was on the West Coast right now! In a small bowl combine the flour, salt, baking powder, and baking soda. In a medium bowl beat together the sugars and butter until creamy. Add the egg and vanilla and beat until combined. Add the flour mixture and beat until just combined. 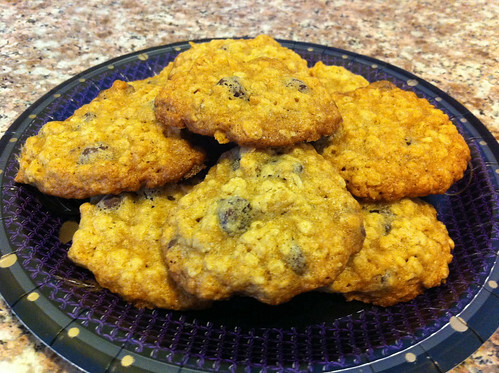 Stir in the oats and chocolate chips. Drop tablespoon-sized portions onto a baking sheet lined with aluminum foil and coated with cooking spray. Bake at 375 deg F for about 10 minutes or until the edges just start to get brown. Let cool for 5 minutes on the cookie sheet before transferring to a cooling rack to cool completely. Enjoy! Based on Two Peas & Their Pod’s Oatmeal Chocolate Chip Cookies. I’m beginning to second guess my decision to update my webpage every day. I just don’t have the time or energy for it lately. But since I know I would regret giving up on my goal this late in the year, I’m just going to push through this rough patch. This week’s posts have been crap-tastic, much to my dismay, but unfortunately that’s not going to change today. Tomorrow is Foodie Friday, which I’ve already got covered, but after that I’m going to have to come up with some original content so that I won’t be disgusted by my webpage every day. I should have some free time this weekend, right? We’ll see. For now I’m going to put this week’s epic fail behind me and go to bed. I have spinning in the morning so I need some sleep before I have to get up at 5 AM. Good night! 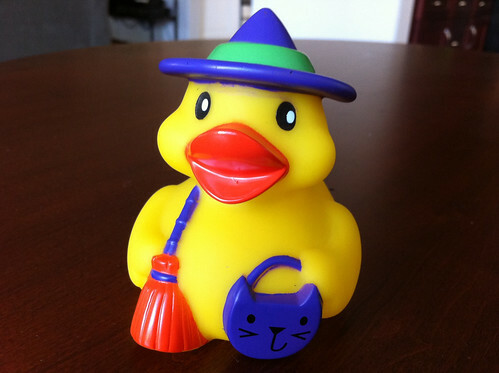 Halloween will be here before you know it (says the trick-or-treating duck dressed as a witch)!